Hey Boomers, this is for you! I’m not afraid to tell my age so I admit it, I turned 65 this year. For those of you who are older than I am, you may be remembering those halcyon days of yore and wondering what’s the big deal. For those of you who are younger, I may seem old and over the proverbial hill! Of course, the hill keeps moving, depending on which side you stand and your point of view. It’s not surprising that the whole event we call aging has been on my mind this year. I didn’t dread turning 65, especially when I considered the alternative, and intellectually, I’m happy about it…yet…There was a little voice in the back of my head asking, “How the hell did I get here and what the f-ck just happened?” (Sometimes profanity is not only called for, it’s recommended.) Then again, as a Gemini, I’m always of two minds and, I can be in two places in my head at once! So I embraced my age, but admit that I’m still thinking about it a lot! 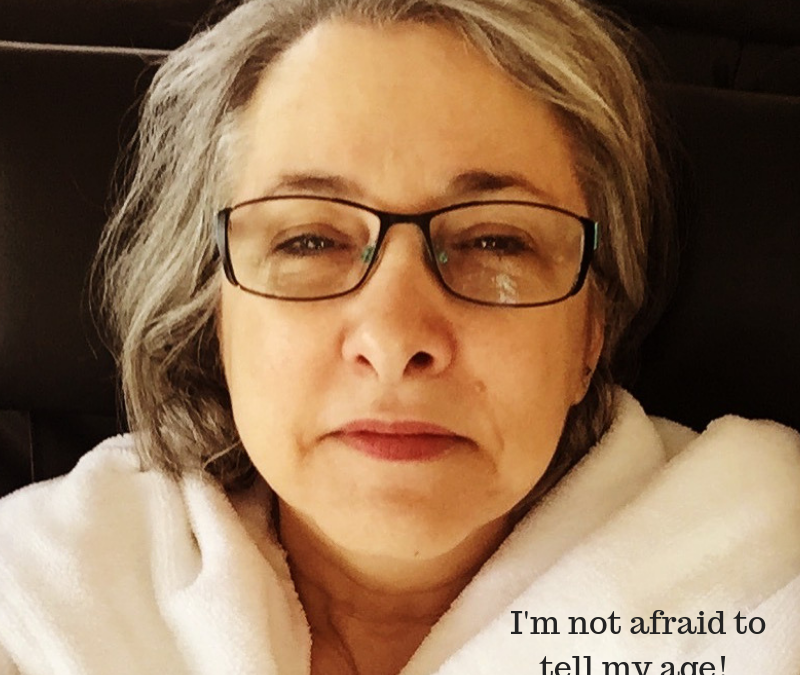 When I turned 60, I challenged myself to blog about it for 60 days, trying to catch a dream for 60 nights in a row, and the issue of aging came up in my dreams and my waking life. Five years later it seems I’m still grappling with the issue of aging. Well at least my subconscious is! It was long before 60, in fact, when I started thinking about it consciously. Was I thinking about it as I watched my grandmother, then my mother age, get sick and die? Or was it the pimply-faced kid at the movies who gave me too much change for my ticket because he charged me the senior rate without even asking? I had grey hair so I must be a senior! Since then, I’ve been watching and tracking how society treats seniors and let me tell you, it ain’t pretty! It’s not an honoured label in western society, and if we are not alert to how seniors are treated, and aware of our own beliefs on the topic, before you know it, you start thinking like “they” do, hating your age, covering up your grey hair (Hoary Heads Rule!) and bemoaning your fate as “old”. In any case, now that I look back at 60, I recall that while that age seemed like a milestone to mark, I wasn’t too worked up about it. I just wanted to go through it with self-awareness. And, wasn’t 60 the new 40? Now that I’ve stared down the barrel at 65 and survived, it seems everywhere I look, everyone wants to give me a “seniors’ discount”! Not that there’s anything wrong with that, as Seinfeld would say, but it’s on my mind! So in the spirit of gratitude for 65 years of blessings and challenges, and with the help of my Facebook friends, I came up with a list of seven blessings, seven good things about aging. See what you think! 1. Life Begins at 65! This time of life, or any “big” birthday can be a rite of passage. It’s a time to be marked with ceremony and celebration. It’s a time to start something new, whether a new project, a course of study, or anything you never had time for in the past. The fact is, we can take more time, time to tackle our list of “some days”, to relax, to join a basketball team! This San Diego basketball team players are all over 80! (Thanks Facebook friend Veronica!) You can slow down from your list of “have to’s” and follow your heart with “want to’s”. The age may vary according to the company, store or government agency but generally by 65 the discounts have begun! While this isn’t a comprehensive list, there are discounts at movies, plays, mass transportation, as well as Medicare and Social Security (in the US), Canadian Pension Plan, GIF, Old Age Security, drug benefits, free university tuition and more (in Canada). Facebook friend Lyn called it “Silver Hair Privilege” and that is the perfect name for this bundle of goodies! You earned it! But I have to note that “silver hair” can be a double edged sword. Women used to avoid talking about their age because society taught us that to be labeled as “old” meant we were written off with little value. We were taught that women of a “certain age” were old, dried up, washed up and invisible…unless they looked good! Cue the hair colouring commercials. Now we can choose to age naturally and gracefully, or to colour our hair. Do what makes you feel good, but be aware if your “good” is defined by someone else. 3. What the F-ck Do I Care? You made it! Your mission, should you decide to accept, is to no longer care so much about doing the right or politically correct thing. This does not give you license to be a jerk, just permission to not care about others’ opinions of you more than your own opinion. This includes freedom from others’ opinions about your lifestyle, hairstyle, clothes, weight, friends, activities, choice of partners, and in a nutshell, the freedom to do, say, behave in a way that would make you proud of yourself, while not caring what your kids or your neighbours think about you. I’m still working on this one in some areas. It’s a process! At this stage of life, your priorities may shift. You know what’s important, and you don’t sweat the small stuff. You’ve been down the road and back, handled the twists and turns and if you are even slightly self-reflective, you’ve learned from the journey. It’s a time to take courses, learn something new, mentor others, and with this wisdom, you will come to accept yourself; the whole package. When we are creative, we connect to Source; the Creator. You don’t have to be an “artist” to be creative but when we stick our fingers in paint or clay, write in a beautiful journal, receive a flash of inspiration, or catch a dream, we connect with the same energy that gives life to creation. When we create anything, we renew and rejuvenate ourselves. We can do this on our own, but to connect with others in community or groups we get the support of other humans and that fills a primal need. According to research, we even live longer in community, whether with friends, lovers or people of all ages. Isolation kills. So follow your heart with a friend and watch your heart get healthy! Facebook friend Jennye has come into her personal power and she’s not alone. You’re finished with all the “issues” of family and growing up. You’ve climbed your mountains and survived. You’re comfortable with yourself, and you can honestly give advice (should anyone care to ask) to the youngsters!! Your mind is open to new ideas and adventures and you’re not done growing….Unless all you do is sit in front of the TV and binge on Netflix. Seniors who do the best in their twilight years are the one’s who feel gratitude for their life; the good with the bad, the challenges with the delights. It’s a time to celebrate and laugh with the children and our friends. Gratitude can pull you out of depression, anxiety, grief and loneliness. What are you grateful for in this moment? Don’t wait until you’re 65 to begin. Remember the TV show Ally McBeal? At one stressful time in her life, she went to therapist Tracey Clark, played by comedian Tracey Ullman, who asked her what her theme song was. Everyone, apparently needs a theme song. So in that same vein, I propose the following theme song for every Boomer turning 65 this year or any year. This song, Young At Heart, is turning 65 too (it came out in 1953), and although it was first recorded by Frank Sinatra, my favourite version is this one by Jimmy Durante. My advice and philosophy is simple. For myself, and hopefully for you too, I plan on staying young at heart, no matter what my age! I’ll take those senior perks and freebies, assuming I can remember them, and rejoice in having made it to a new stage of life and growth . What will your next age look like?